Name three common fast-food restaurants in five seconds…. Go! Hopefully you came up with something along the lines of McDonald’s, Wendy’s, and Burger King. Since their creation, the trio have been constantly fighting for brand loyalty. In an effort to attract new consumers, each found ways of making their product unique. 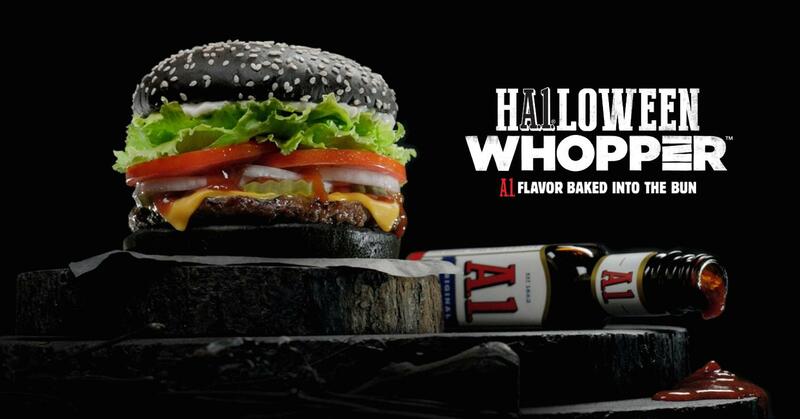 Recently, Burger King released the Halloween Whopper, a normal Whopper with a black, A.1 flavored bun. If you have Facebook, Twitter, Instagram or really any social media outlet, you probably experienced Burger King’s presence on social media. Before the launch of the Halloween Whopper, Burger King teased their consumers with a promo video featuring thunder, lightning, and a lunar eclipse with a black bun burger placed front and center – stating “Something Wicked is Coming” on Twitter. As the Halloween Whopper was announced publicly, Burger King released this press release: “Burger King Restaurants Unveil the A.1 Halloween Whopper Sandwich with A.1 Flavor Baked into the Black Bun.” stating this whopper was inspired by Japan’s specialized burger. They followed up by saying “We tailored the flavor of the black bun to the American palate with A.1. sauce, a flavor this country loves, and we’re delivering it in a way that’s never been done before by baking it into the bun. It may look Japanese but it tastes like America.” The hashtags of #HalloweenWhopper and #SomethingWickedIsComing filled Twitter and other mainstream social media outlets because of the non-traditional appearance. People who were daring enough to try it- are daring enough to share the results with the Internet. Twitter comments are consistent in complaining of a green stool (which admittedly sounds very unpleasant). This green situation might make you wonder, “What people are willing to try without pausing to consider what’s going into their bodies?” Burger King hasn’t publicly released the ingredients or replied to the negative comments. 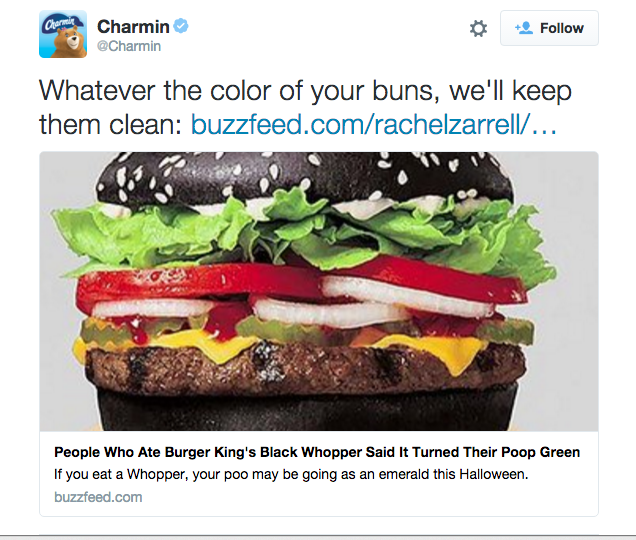 Burger King seems to be choosing silence as their strategy in this crisis, but Charmin has taken a clever chance to chime in. Comments such as “whatever the color of your buns, we’ll keep them clean”, posting a link to the Buzzfeed article on the green poo crisis. Negative or positive press, Burger King is taking over social media, 29,000 tweets in a single week. America’s detachment from our food has reached crisis level proportions. We don’t know what the ingredients in our food are, where they come from, who grows and or genetically modifies them. And it’s not without its consequences; as a nation, we are morbidly obese and chronically unhealthy. This way of living is becoming very expensive. Health care for weight-related issues puts a huge strain on the health-care system. Burgers turning our poo green is a light-hearted example, but shines light on the heart of the issue. We honestly have no idea what’s in our food, or how it affects our health, and we really don’t seem to care. This example reaches the point that a halloween themed hamburger is turning poop green and people think it’s hilarious. The food we eat literally affects all the cells of our body. This concept of detachment is what Marx calls commodity fetishism. When a culture forgets, ignores, or is otherwise separated from the source of a commodity (in this instance where food comes from), the culture becomes wasteful and overuses, almost always at the disadvantage of those who create the given commodity, and in this case ourselves as well. We implore anyone reading this to once a week, once a month even, get together with friends and family and cook a meal from scratch. Be grateful for every ingredient. Have you tried the #HalloweenWhopper yet? Let us know your thoughts on this controversial burger.